Although baby lamps have traditionally been used as nursery decor accessories, there are plenty of ways to add decorative accents with nursery ceiling lights too. And if you add a dimmer switch, you can cover all your nursery lighting needs in one go! Our Favorite Nursery Chandeliers Online! A beautiful addition to any baby room, nursery chandeliers add a touch of whimsy no matter what your decorating style. Available in a dazzling assortment of colors and themes, it's easy to find one to match or complement almost any baby nursery decor. And they're not just for girls! In a small nursery room I would avoid having a focal point baby ceiling light. Generally it will create a cluttered feeling and will draw the eye up away from the rest of the room. Because of the bigger spaces, this does not present a problem in a larger baby nursery. As with any element of baby nursery decor, you have the choice of making your nursery chandelier a fanciful focal point in your nursery room or using it as a simpler decor accent. The standards rules apply when choosing from the many nursery chandeliers available - try to avoid a cluttered feeling and don't overdo your theme. If your baby room is not particularly large, you may want to consider a mini-chandelier. 3-arm chandeliers also tend to be less overpowering than the conventional 5-arm type. 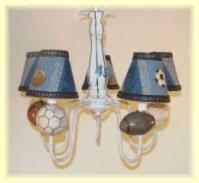 Ceiling medallions are a simple unobtrusive way to beautify your nursery lighting fixture. Choose a medallion in an accent or neutral color depending on whether or not you want to draw attention to the ceiling in your baby room. If you've painstakingly painted clouds over baby's head you'll want people to notice - believe me, it's back-breaking work! Think about a sun or moon ceiling medallion to match the theme. Remember, you can shop for a ceiling medallion in the general lighting department - it doesn't have to be specifically made for a baby's room. Alternatively, you may not want a medallion to detract from your artwork on the ceiling. In this case, simple recessed ceiling lights can do the trick. They're functional but unassuming. If you want to turn them into a work of art, try stenciling a design around them. Stenciled designs are also an inexpensive alternative to a ceiling medallion. 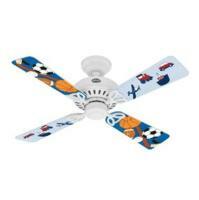 Kids ceiling fans can be a bit pricey, so if you have an old ceiling fan lying around or not being used in another room, repaint it to match your nursery decor. Jazz it up with stickers or craft materials. If you don't have one lying around why not visit a garage sale or two - you never know what you might find! Hanging lamps are similar to baby chandeliers but without the frills. A single bulb hanging from the ceiling is covered with a simple nursery lamp shade chosen to match or accent your decor. 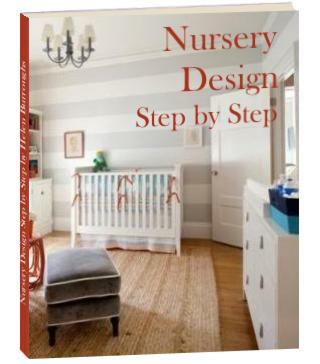 If your budget is tight this is an inexpensive but effective nursery lighting alternative. If you have an old lampshade in need of a revamp you can recover it or paint it with fabric paints and use it in your baby room. You can even make your own from scratch if you are feeling adventurous. With nursery chandeliers and baby ceiling lights you can light up your baby's world. How you go about it is limited only by your imagination! Check out our baby lamps and nursery night lights pages for your other nursery lighting requirements. 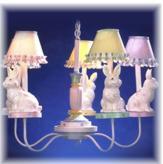 And don't forget to take a look at our favorite nursery chandeliers online!